Friedrich Max Muller, a philologist and a pioneer in Vedic studies, philosophy, mythology and comparative religion was born in Germany but had studied and lived most of his life in Britain. Max Muller was also a founder of the academic field of study of Indology and has also written scholarly and popular work on the subject. Max has also written quotes about various topics which gives life a real meaning and inspiration. But most of his quotes written in his books are inclined towards religion and Hinduism. 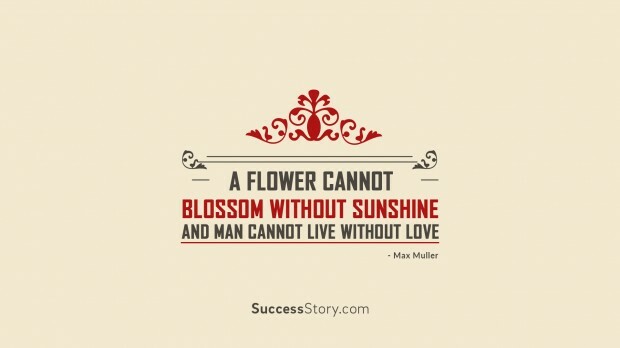 "A Flower Cannot Blossom Without Sunshine And Man Cannot Live Without Love"
Max Muller started his formal education at the age of six. At the age of 18, Muller entered the Leipzig University by winning a scholarship and continued his studies by learning Latin, Greek and Philosophy. He was awarded a Doctorate of Philosophy Degree when he was just 20 years of age. In 1844, Muller went to Berlin. Lectures received there, by Friedrich Schelling proved to be very influential for him and his intellectual development. At this time, Muller also translated Upanishads on the request of Schelling and continued his research work in Sanskrit. This was also the time when Muller published his first book. In 1850, Muller was appointed as deputy Taylor Institution professor at Oxford University. In 1860 Muller lost an election for Boden Professorship – Sanskrit due to the lack of first-hand practical knowledge of India. In 1868, Muller founded a position and became the first Professor of Comparative Philology at Oxford University. Friedrich Max Muller retired from his duties in 1875.